Hola everyone! A few weeks ago I posted about working on 3 Disney TP Mini Albums for my friend’s girls who visited Walt Disney World for their summer vacation. Well, the wait is over! I am finally done with them and I couldn't wait any longer to share them with you. I will post one a day until you have seen them all. They are gorgeous! Ready? Ok, here’s the first one! I used Mod Podge and digi paper to cover the toilet paper rolls. For the embellishments, I purchased the Disney WordArt from TrixieScraps, which I printed on my computer. Another digital kit I used was the Remember the Magic kit from No Reimer Reason. 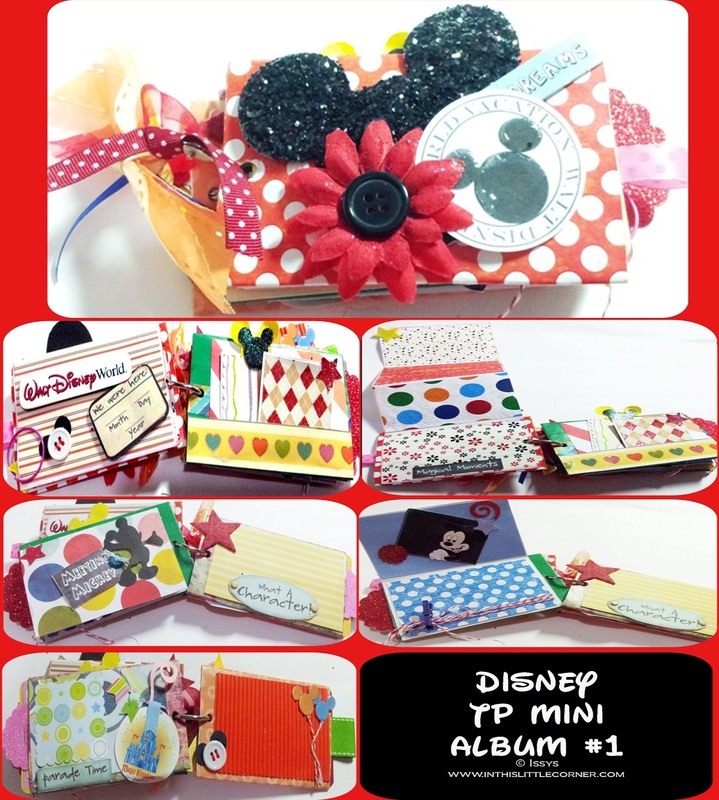 The album has tags, glitter cardstock, stamps, buttons, flowers and lots of space to place pictures or journal. I know the girls will be thrilled with their mini albums! Thanks for looking! I hope this inspired you to make something special with those toilet paper rolls. And come back tomorrow when I'll reveal Mini Album #2. See you then! My first time participating in MIM. Thanks for visiting! Thanks for sharing on Make it Monday and I do hope we see more of your crafting . Thank you! I love your blog and the challenges. AWESOME , you have truly made a beautiful mini , so much detail and interest ..LOVE LOVE . Thanks for joining us with our challenge at Parade your Crafts . Thanks Crystal! And thank you for those challenges that keep us inspired. Fabulous project. Love the glitter ears. Thanks for joining us in the challenge at the Parade Your Crafts Blog. Nicely done, thanks for playing our Anything Goes challenge at Love to Scrap...very cool! OMG!!! I adore your mini!! I LOVE Disney! Super cute! great job!!! Hope to see you again at PYC!! Too cute!! Love it! Thanks for playing along with us at Loves To Scrap!! Your project is awesome! Thanks so much for sharing your talent with us in the Love To Scrap! Challenge Blog's "Anything Goes!" challenge!